Colome swept Marty in a prep volleyball match on Sept. 10. Set scores were 25-10, 25-14, 25-12. Makayla Shippy had nine aces and 20 assists. Rayne Hermsen added three aces, five digs, four kills and one block. Kaydee Heath led the team with 10 kills and five digs. Saydee Heath finished with six kills while Carleen Burger had 5 kills. 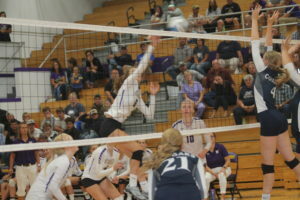 Platte-Geddes defeated Colome 3-1 on Sept. 11. The scores were 25-13, 25-19, 25-27 and 25-22. Shippy had 28 assists and four digs. Kaydee Heath had 13 kills, eight digs, two blocks and an ace. Hermsen had six kills and five digs and two aces. 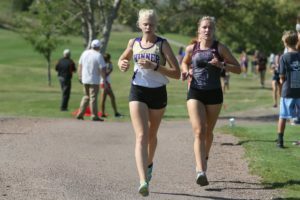 Winner Area girls cross country team took second place in the Big Dakota Conference and Chamberlain Invite on Thursday. Sidda Schuyler placed 4th. 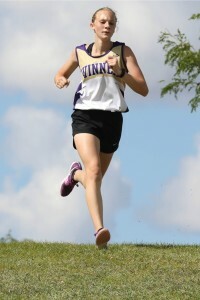 She was followed by Saige Schuyler, 9th; Jaclyn Laprath, 18th; Aryn Meiners, 28th; Meagan Blare, 41st; Melanie Brozik, 59th. In the varsity boys race, Wyatt Turnquist placed 29th and Joseph Laprath placed 59th. In the junior varsity girls, Madison Thieman placed 10th; Gabby Kocer, 24th; Katherine Jankauskas, 31st; Trinity Vrbka, 35th. In the junior high boys, Konner Osborn took 2nd. The next action for the Winner area team will be Sept 22 at Platte and Sept. 25 at Todd County. Winner Area girls cross country team won the Lyman Invitational on Saturday. In the girls varsity, Sidda Schuyler took first. She was followed by Saige Schuyler, 4th; Meagan Blare, 8th; Melanie Brozik, 10th; Aryn Meiners, 14th; Jaclyn Laprath, 20th. In the varsity boys, Joseph Laprath was 30th. In the junior varsity girls, Madison Thieman placed 3rd; Gabby Kocer, 8th; Trinity Vrbka, 10th; Katherine Jankauskas, 11th. Konner Osborn placed 4th in the junior boys division. Parkston won the team title in the Winner boys golf invitational on Sept. 11. Second place went to Mobridge-Pollock and third to Chamberlain. Gage Watson led the Warriors as he placed 12th. In the junior varsity, Landon Calhoon placed 4th; Ryder Halligan, 5th and Karson Keiser, 7th. The Winner boys golfers competed in the Todd County Invitational on Thursday. Gage Watson shot an 81 and Nathan Monk shot a 101. Watson placed fifth in the tournament. In the middle school results, Karson Keiser shot a 47, Ryder Halligan, 48 and Landon Calhoon, 51. Winner High School volleyball team defeated Bennett County in three sets. Winner won 25-11, 25-9 and 25-5. Morgan Hammerbeck and Addy Root were 100 percent in serving. Alexis Richey had 6 aces and Ellie Brozik, 2. Hammerbeck had 15 kills, Abby Marts, and Kalla Bertram, 6 each. Root had 26 set assists. Hammerbeck had 13 digs and Gracie Littau, 10. Brozik and Marts had one assist block. As a team, Winner was 95 percent in serving, with 10 ace serves, 30 kills, 29 set assists and 45 digs. 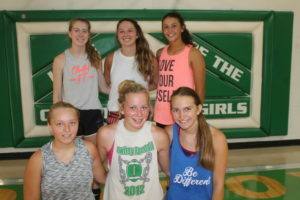 “We came out ready to play from the start,” said coach Jaime Keiser. “We did a great job of serving and attacking the ball. We were getting in defensive position and playing very well as a team. Our serve receive was better but we still got out of system. We did a great job of talking and playing together as a team,” said Keiser. The Lady Warriors are at the Big Dakota Conference tournament on Sept. 15 in Ft. Pierre. On Sept. 17, Winner travels to Mobridge. 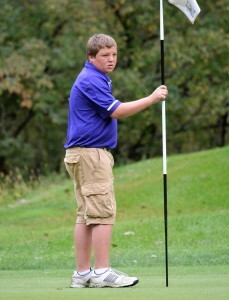 Gage Watson of Winner High School placed 10th at the Chamberlain golf meet on Aug. 30. Placers for middle school boys include Karson Keiser, 2nd; Ryder Halligan, 3rd and Landon Calhoon, 6th. 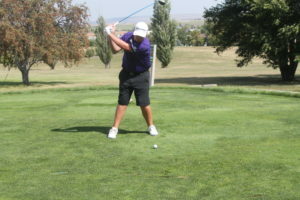 Gage Watson of Winner placed 4th in the Big Dakota Conference golf tournament Sept. 6 in Chamberlain. Nathan Monk shot a 112. Chamberlain won the team title. 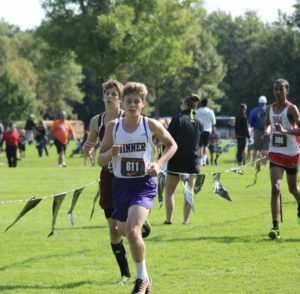 Winner Area cross country team took part in the Nike Heartland preview cross country meet on Saturday. In the girls varsity, Sidda Schuyler placed 9th; Saige Schuyler, 48th; Meagan Blare, 78th; Melanie Brozik, 81st; Aryn Meiners, 92nd and Jaclyn Lapath, 99th. In the junior varsity boys race, Wyatt Turnquist was 57th and Joseph Laprath was 106th. The next meet for the Winner Area team will be Sept. 13 at Chamberlain and Sept. 15 at Lyman. Colome volleyball team defeated Lyman on Sept. 4. The scores were 25-23, 25-12 and 25-15. Serve leaders were Rayne Hermsen, 18 points, 4 aces; Makayla Shippy, 8 points, 2 aces; Saydee Heath, 7 points, 1 ace. Kill leaders were Kaydee Heath, 11; Haley Krumpus, 6 and Hermsen, 5. Rayne Hermsen, Kaydee Heath and Saydee Heath each had 1 block. Shippy had 9 digs, Saydee Heath, 8. The Cowgirls played Tripp-Delmont/Armour on Sept. 8. The Cowgirls lost the match. Serve leaders were Saydee Heath, 10 points, 1 ace; Shippy, 6 points, 2 aces. Kaydee Heath and Hermsen each had 8 kills. Hermsen and Kaydee Heath each had 1 block. Shippy had 12 digs, Krumpus, 9 and Kaydee Heath, 8. 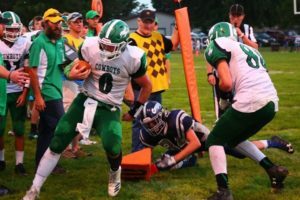 Colome Record Improves to 3-0… #3 in Class 9B! Chase Dufek ran for 166 yards and scored two touchdowns as the Colome Cowboys defeated Burke/South Central 62-12 Friday. The victory gives Colome a 3-0 record. Jackson Kinzer ran for 81 yards with a touchdown. In passing, Kinzer had 13 completions for 193 yards. Layton Thieman had 103 yards receiving and two touchdowns. Colome has a bye week this week with no football game. 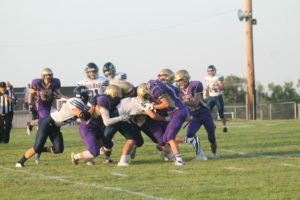 The next game will be he homecoming game on Sept. 14 when they host Gayville-Volin. Winner High School football team made a strong showing as they defeated West Central 36-7 Friday night in Winner. The Warriors scored 28 first half points. Coach Dan Aaker says this is best first half Winner has played in a year and a half. “We came out focused and ready to play,” he said. The Warriors scored on its first four possessions. Trevor Peters opened the scoring on a 7 yard run. At the end of the first quarter, quarterback Brady Fritz scored on a 21 yard run. Fritz got on the board again with 5:27 left in the second quarter on a 11 yard run. Aaker explained the Warriors drive at the end of the first half was really big. The team did a good job of utilizing the clock with Peters scoring on a 6 yard run with 28 seconds left in the first half. The coach said the Warriors had good balance with Phillip Jorgensen, Brady Fritz, Trevor Peters and Sam Kruger running well. West Central scored in the 4th quarter with 8:50 left in the game. Winner’ final score came on a 20 yard run by Fritz. The Warriors had 417 yards rushing and 23 first downs. Fritz was the leading rusher with 116 yards followed by Jorgensen, 98; Peters, 76; Kruger, 37 and Nolan Sachtjen, 33. In passing, Fritz was 2-5 for 26 yards. Winner’s defense was led by Shea Connot with 9 tackles, Brandon Volmer, 7; Preston Norrid, Colton Schroeder and Oscar Pravecek, 5 each and Kruger, 4. Aaker said in the second half Winner did not play as sharp. “Our guys learned that they need to keep focused all the time,” said the coach. This will be a bye week for the Warriors as they will have no football game. The next game will be Sept. 14 at Valentine, Neb. This week in practice the team will get back to fundamentals like they worked on earlier in the season. The coaching staff will start introducing information on Valentine game but basically this will be a Winner Warriors week. 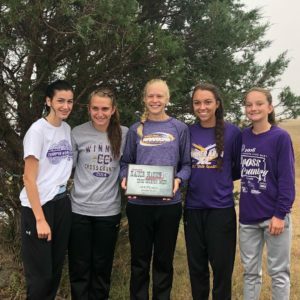 The Winner Area girls cross country team took fourth place at the McCook Central/Montrose Invitational on Aug. 28. Sidda Schuyler led the Lady Warriors as she placed fourth. Also placing for the Winner Area girls were: Saige Schuyler, 12th; Meagan Blare, 26th; Melanie Brozik, 32nd; Aryn Meiners, 37th; Jaclyn Laprath, 47th. Placing for the varsity boys were Wyatt Turnquist, 41st; Joseph Laprath, 71st. In the girls junior varsity race, Madison Thieman was 16th and Gabby Kocer was 41st and Trinity Vrbka, 57th. The next action for the team will be Sept. 8 in Sioux Falls.